Genesis 15 comes fairly early in the major section of the “generations of Terah” (Genesis 11:27-25:11). The Lord has already sent Abram (not yet Abraham) to Canaan in chapter 12. 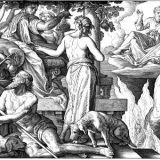 After a brief sojourn in Egypt, Abraham rescues Lot from being a prisoner of war in Genesis 14. 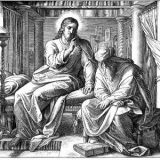 Abram is then blessed by Melchizedek. The phrase “after these things” refers then to these previous events. Abram has left Ur in faith, not knowing exactly where the Lord is leading him (Genesis 12:1). 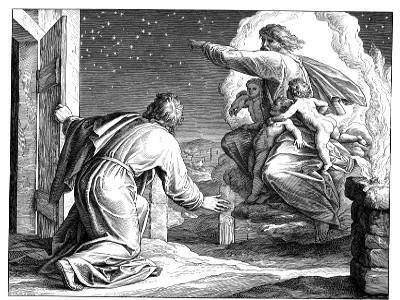 The Lord has promised Canaan to his offspring, and Abram builds an altar in an act of worship (Genesis 13:14-18). The Lord has even given him victory over kings with a relatively small band of 318 men (Genesis 14:13-16). Abram has every reason to continue trusting the Lord who has led him this far. Yet the Lord comes to comfort Abram in one continuing problem: he has no son. God has promised him numberless offspring, yet he remains without a child. As Paul says in Romans 4:18-22 and Hebrews 11:12, humanly speaking Abram’s body was “as good as dead,” since he was well beyond the human capacity for fathering a son. Abram then hears the Word of the Lord and believes the one who has made this promise. A few specific notes are in order. First, “the Word of the Lord came to Abram in a vision.” The word vision here is derived from a word meaning “to see,” and also occurs in Numbers 24:4 and 24:16, where it refers to Balaam, and Ezekiel 13:7, where it refers to the “false visions” of the false prophets. Abram therefore receives the revelation visually in some way. Inspiration, generally speaking, does not occur always in the same way. Other prophets also received direct visual revelations, such as Samuel (1 Samuel 3), Jeremiah (Jeremiah 1:11-12), Isaiah (Isaiah 6:1-7), Ezekiel (Ezekiel 1), and so on. Abram himself will fall into a “deep sleep” later in Genesis 15, which in itself indicates some sort of prophetic fit (especially since the corresponding darkness is described as “dreadful and great”). Second, the Lord directs Abram to look at the stars as a way of showing to him that He is faithful in His promise of a son. The created stars serve as a sign and a confirmation of the promise. If Abram were to be able to number them, he could also number the offspring of this promise. As mentioned earlier, Paul cites this expression directly in Romans 4:18, but it is alluded to throughout the Old Testament in Genesis 22:17; 26:4; Exodus 32:13; Deuteronomy 1:10; 10:22; and 1 Chronicles 27:23. This also explains David’s sin in 2 Samuel 24 when he takes the census, because attempting to count Israel (apart from an express command to do so) is tantamount to wondering whether the Lord will keep His promises. Finally, “Abram believed the Lord, and He counted to him as righteousness.” Paul uses this verse to prove in Romans 4 that Abraham was not justified by his works, but by his faith. Therefore, the Gentiles also, who are not the sons of Abraham according to the flesh, are still sons according to the promise. Paul makes the same point in Galatians 3:5-6: we are not justified by the works of the Law. These passages also clarify any ambiguity with the pronouns which might seem to exist in Genesis 15:6. James also makes reference to this verse in James 2:14-26. His overarching point is that faith cannot exist without good works. It is not enough to say “I am a Christian,” if one then turns and acts in an unchristian way. Abraham therefore demonstrates his living faith through his willingness even to offer up his own son Isaac, the son of the promise upon the altar. In this way, Genesis 15:6 is fulfilled, because the faith which believes the promise of God is the same faith which then expresses itself in an unshakable trust that “God was able even to raise him from the dead, from which, figuratively speaking, he did receive him back” (Hebrews 11:19).